(1) MARTIAN SAVINGS TIME. If you’re tempted to complain about having to reset your clock, think about these folks at JPL: “When flying to Mars is your day job”. (2) THE BIG BUCKS. The Bank of England is taking nominations — “Think science for the new £50 note”. Or write to: Think Science, Bank of England, Threadneedle Street, London EC2R 8AH. You’ve got until Friday 14 December 2018. We’ll announce the chosen character in 2019. (3) FANTASY CHOW. Atlas Obscura readers filled out their menus with “The Fictional Foods We Wish Were Real”. What fictional foods make you as excited as a hobbit in a pantry? Sure, you can buy a Wonka Bar at any candy store. You can drink a sugary Butterbeer at the Wizarding World of Harry Potter attraction in Orlando. And you can find a recipe for Lembas Bread on about a million Lord of the Rings fan sites. But none of these initially fictional foods could ever live up to how we imagined they would taste when we first saw or read about them…. Recently, we asked Atlas Obscura readers to tell us which fictional food had sparked their imaginations more than any other…. We’ve collected our favorite responses below. Next time you encounter a mouth-watering food that doesn’t exist, try and decide for yourself what incredible, impossible flavors it might actually have…. (4) CORDWAINER SMITH’S ALTER EGO. Paul DiFilippo has reproduced Paul M.A. Linebarger’s 1951 article for Nation’s Business, “Hotfoot for Stalin” at theinferior4. … On the big screen, Swofford had roles in Robert Wise’s The Andromeda Strain (1971), Stanley Kramer’s The Domino Killings (1977), Blake Edwards’ S.O.B. (1981), John Huston’s Annie (1982) and Ridley Scott’s Thelma & Louise (1991). …Swofford provided the voice of the title character in the 2018 short film Happy the Angry Polar Bear, written and directed by his grandson. November 3, 1925 – Monica Hughes, Writer from England who emigrated to Canada, and became known as known as one of Canada’s best writers for children and young adults, especially science fiction. She is best known for the Isis Trilogy, about the descendants of Earth colonists on a far-flung planet, which won the Phoenix Award from the Children’s Literature Association. Invitation to the Game, a hard science fiction dystopian novel which features robots and has been translated into numerous languages, won the Hal Clement Young Adult Award. November 3, 1928 – Tezuka Osamu, Artist, Animator, and Producer who is often considered the Japanese equivalent to Walt Disney, a major inspiration during his formative years. His manga series, all of which have had English language translations, include Astro Boy, Black Jack, Kimba the White Lion, and Phoenix, all of which won several awards including four Eisner Awards. November 3, 1933 – John Barry Prendergast, Oscar-winning Composer who wrote the scores for more than 120 films, including the genre works Moonraker (and 10 other Bond films), Starcrash, Mercury Rising, Howard the Duck, The Black Hole (for which he received a Saturn nomination), the 1976 King Kong, and the 1972 Alice’s Adventures in Wonderland. However, he is best known for his pièce de résistance: the haunting, emotive soundtrack for Somewhere in Time – the Saturn-winning film adaptation of SFF author Richard Matheson’s novel Bid Time Return – for which he also won a Saturn Award. Rather than taking a set fee upfront, he had presciently agreed to a percentage of sales. The soundtrack became one of the most popular movie soundtracks of all time, eventually selling more than a million copies, and continues to sell well to this day. November 3, 1950 – Massimo Mongai, Writer from Italy who produced Memorie di un Cuoco d’Astronave (Memories Of A Spaceship Cook), an apparent merging of space opera and cooking manual which won Italy’s Urania Award. I’m really, really hoping someone has read this in the original language as I’d love to know what it’s about! November 3, 1952 – Jim Cummings, 66, Voice Actor and Singer who has hundreds of voice credits in animated features and TV shows, including Aladdin, The Lion King, Shrek, Who Framed Roger Rabbit (as a bullet), The Addams Family, Batman: The Animated Series, Duck Dodgers, The Transformers, Teenage Mutant Ninja Turtles, Gargoyles (one of my favorite shows), at least three of the animated Star Wars series, and dozens of videogames. He has won two Annie Awards, which are given to recognize outstanding work in the animation industry. November 3, 1952 – Eileen Wilks, 66, Writer whose principal genre series is the World of Lupi, a FBI procedural intertwined with shapeshifters, dragons and a multiverse. Highly entertaining, sometimes considered romance novels, though I don’t consider them so. The audiobooks are amazing! November 3, 1963 – Brian Henson, 55, Actor, Puppeteer, Director, and Producer who, as the son of Jim and Jane Henson, now runs the Jim Henson Company along with his sister Lisa. He voiced the character of Hoggle in the original Hugo and Saturn Award-nominated Labyrinth, and is in the process of producing a remake of that movie. He has provided other voice and puppet characters in many films, including Little Shop of Horrors, Teenage Mutant Ninja Turtles, Muppets from Space, and The Muppets’ Wizard of Oz.. He was a producer for the awesome Farscape series, but the less said about his venture The Happytime Murders, the better. November 3, 1964 – Marjean Holden, 54, Actor who has had recurring roles in the genre TV series Crusade, the short-lived spinoff from Babylon 5, and in the Beastmaster series. She’s also appeared in Philadelphia Experiment II, Bill & Ted’s Excellent Adventure, Babylon 5: A Call to Arms, The Lost World: Jurassic Park, Dr. Caligari, and Nemesis, and had guest parts on episodes of Star Trek: Deep Space Nine and Tales from the Crypt. November 3, 1964 – Brendan Fraser, 50, Actor and Producer whose genre work includes The Mummy films, which I dearly love, but also Monkeybone, based on Kaja Blackley’s graphic novel Dark Town, the Bedazzled remake, Sinbad: Beyond the Veil of Mists, Looney Tunes: Back in Action, Journey to the Center of the Earth, Encino Man, G.I. Joe: The Rise of Cobra, and voicing Robotman on the Titans series that airs on DC Universe. (8) GET ON BOARD. 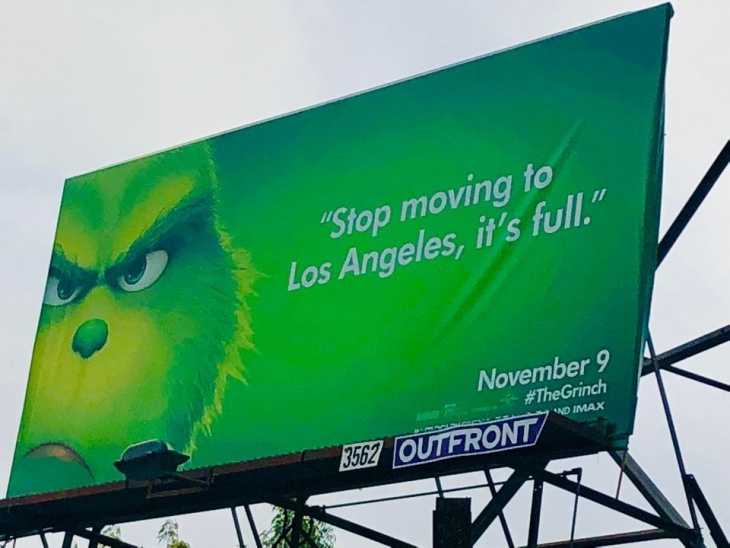 Advertising for The Grinch movie, which opens November 9, has popped up all over LA — “Essay: The LA Grinch Billboards Are Savage And Spot-On”. The Grinch is also lobbing localized insults at other cities, like New York and Chicago. As much as we resent viral marketing schemes, we have to tip our hats when they’re this good. I mean, are they even a joke? Or are they just extra L.A.? Jim C. Hines, Robert J. Bennett and Kij Johnson. (10) STROSS. Camestros Felapton found something to praise — “Review: The Labyrinth Index by Charles Stross”. Good grief, nine books into the Laundry Files and Stross is still creating these weird, tense thrillers without really ever repeating himself. The novels have gradually shifted from clever pastiche to exploring their own premise…. (11) OUTLAWED CANDY. Let Atlas Obscura tell you about “Marabou M Peanut”. M&M’s are known and enjoyed worldwide as movie snacks or general goodies. However, since 2016, this has not been true for Sweden, where the sweets have been banned due to a trademark dispute with a local candy company’s M Peanut. Marabou’s M Peanut is very similar in taste and appearance to Peanut M&M’s: Both are chocolate-covered peanuts with lowercase m’s on their packaging. They’re so similar that one might think Marabou is an imitation brand. However, in Sweden, M&M’s are seen as the imitator, as Marabou’s candy had been sold in its native country for 50 years before M&M’s arrived. (12) XENA PREBOOT SCRIPT. The 2016 attempt to reboot Xena never made it off the ground, but now a draft of the pilot script is available online for anyone to read (io9/Gizmodo: “Check Out the Script For the Pilot of the Canned Xena Reboot”). Now I’m wondering when the first dramatic reading will take place at a con. Xena, brilliant warrior, princess, hero, and one more cancelled reboot. But now, thanks to Xena Movie Campaign, a Facebook fan group, with the blessing of Javier Grillo-Marxuach, who wrote it, the unused script for the pilot episode of an attempted 2016 reboot of Xena is now available to read online. (13) GOT WORMS? BBC discusses “Why some computer viruses refuse to die”. But what is a radio telescope? How can we observe space through radio? Does Jupiter sing? Are the bodies of the solar system harmonising in a heavenly chorus? Well, that’s not far off the mark. If you have the right equipment, you can even listen to Jupiter’s emissions yourself! You’ll need a shortwave radio (Jupiter radiates strongest at 22Mhz), and you’ll have to build yourself a large dipole antenna. What you’ll hear is an eerie, aggressive static, a lot like waves crashing on the beach. These are the radio emissions produced by charged particles racing through Jupiter’s magnetic field. (15) VIDEO OF THE DAY. “Mr. Death” from Norwegian director Andreas J. Riiser is a short film on Vimeo that imagines what Death would be like if he was a chain-smoking Norwegian who has a buzz cut and loves Beethoven’s Seventh Symphony. (1) SPELLING BEE. Blake Hennon has the answers in “Is it Wookie or Wookiee? The Times’ definitive ‘Star Wars’ style guide” at the Los Angeles Times. When most people think of “Star Wars” style, Princess Leia’s side-buns hairdo and white robe or Darth Vader’s fearsome black helmet and cape probably come to mind. For copy editors, it’s more likely how to punctuate a jumble of words such as Star Wars Episode IV A New Hope or whether to spell Chewbacca’s species as Wookie or Wookiee. With the venerable space opera about to start bringing new stories to the big screen at the planned rate of one per year — and the upcoming fleet’s worth of Times stories that will cover all the developments and details of the on- and off-screen “Star Wars” saga — The Times’ copy desk decided it would help in editing to have an organized guide to facts, names and terms that might appear in our coverage. I volunteered to put it together, and relied on the films; Lucasfilm’s publicly available databank; the Academy Awards’ database; images of officially licensed products; and Times precedence, stories, style rules and tendencies (which sometimes override other groups’ preferences). To answer the questions above: “Star Wars: Episode IV – A New Hope”; Wookiee. (3) FAN SERVICE. Mark Hamill goes undercover as a stormtrooper (one word) on Hollywood Blvd. to raise awareness for the Omaze charity that’s giving away a chance to win two tickets to the Star Wars: The Force Awakens premiere in exchange for a $10 donation. The contest ends in less than two days. (4) FROM HEADCANON TO THE SCREEN. “7 fan theories so good they actually came true” at RadioTimes. Considering he’s a centuries-old genius and Time Lord, the Doctor always did seem to have a bit of trouble piloting his Tardis – but fans had a solution for why that could be (apart from it being an obsolete Type 40, of course). Given the time machine’s central console was hexagonal (and all the controls therefore couldn’t be reached at any one time), could it be that the Tardis was intended for not one, but six pilots? This fun idea circled around for a while and made some appearance Doctor Who spin-off media before it was finally embraced by the main series in 2008, with David Tennant’s Doctor enlisting all his friends to help pilot the time machine in series 4 finale Journey’s End. (5) THERE’S AN APP FOR THAT. “It’s what’s on Mark Watney’s smartphone,” says Will R.
Through a new service (“IFTTT Blog – Houston, we have liftoff”) you can get things like a notification when the season changes on Mars. (6) BE YOUR OWN ANT FARM. Becky Chambers remembers playing an ancient PC game: “Extended Memory: SimAnt”. Despite the complexities, my task was clear: recruit as many followers as I could, then march into enemy territory. “Oh my god,” a distant voice in my head said. “This is a Zerg rush…with ants.” I do not know what this voice meant. As an ant, I am ignorant of such things. So, here’s the bottom line: India has a new generation of gifted graphic storytellers, who are doing comics that speak in direct and powerful ways to the country’s politics, comics that experiment with new visual languages for comics, often drawn from the country’s rich and diverse folk traditions. These artists are slowly but surely producing work that people should be paying attention to. But, you can’t really find them in Indian bookstores when you go looking and they are not making their way into comics specialty shops in the United States. If you want to find India comics, you have to look online. (8) KEG BUST. Andrew Porter says, “This almost (not really) makes up for HPL’s bust no longer being the World Fantasy Award….” Lovecraft Reanimator Helles Lager from Narragansett Beer. The History: HP Lovecraft’s ‘Herbert West—Reanimator’ and the 1985 film adaptation, Re-Animator, are horror fan favorites. In the story, Dr. West and his accomplice experiments with human reanimation by injecting fresh corpses with a serum meant to bring the dead back to life. We wanted to create a serum to resurrect one of our own; our beloved Bock beer. …I know what my two absolute favourites of the year are, though. Elizabeth Bear’s Karen Memory (Tor) and Ann Leckie’s Ancillary Mercy (Orbit) tie for first place in my heart. One is an adventure story in a steampunk-influenced city on the American Pacific coast in the late 19th-century, whose eponymous protagonist finds herself running headfirst into all kinds of peril—including international espionage plots—while falling in love with another young woman. The other is the capstone of a fantastic trilogy about power and personhood, and what you do with what’s done to you: it brings all its threads together, and ties them up in a conclusion that’s as perfect as it is unexpected. If you’re only going to read two novels published this year, my recommend is read them. (10) T-SHIRT TNG. Have you been there, done that? 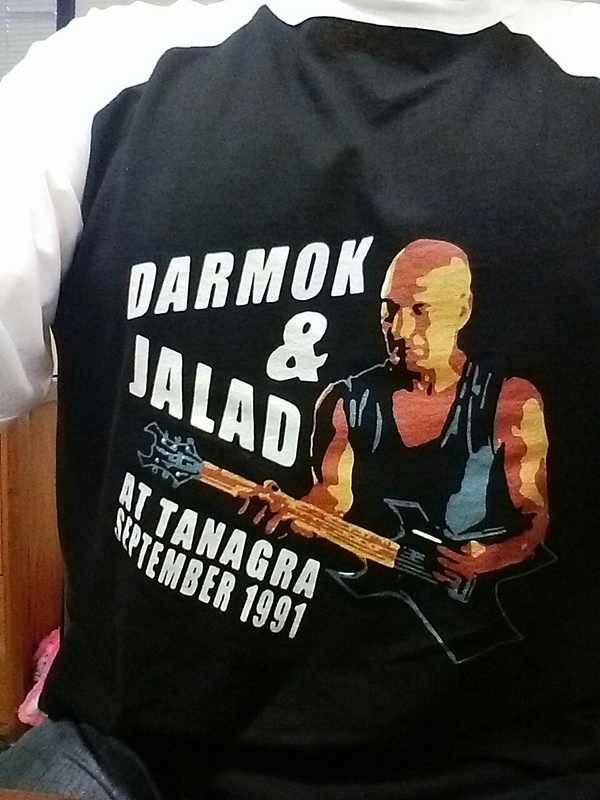 Now own the t-shirt! (12) OBITUARY. SF Site News reports artist Jon Arfstrom died on December 2. Arfstrom is believed to have been the last of the classic Weird Tales cover artists to be alive. Lines and waiting are a fact of life with cons. This is easy when you’re child-free and have access to your phone/book/daydreams/whatever. But with a baby, wait times are an event in themselves. Most parents—and hopefully that includes you—have some tricks that can be parsed out over time to try and keep the baby occupied. A good idea is to prep for the con like you would for a long road trip: have new toys/books to spring forward, and use whatever tricks you have up your sleeve. For example, our daughter is fantastic when getting hand-fed small snacks (Cheerio’s, Yums, etc.). We made sure we had an inventory of these and used them as our first go-to when she started to get impatient, albeit at about half the speed we’d normally feed them. We also got lucky in that our baby recognized some of the characters we’ve introduced her to thanks to the cosplayers, so we could point out Batman and catch her interest for a few minutes. (14) DON’T TELL BRAD TORGERSEN. Cracked.com lists “6 Depressing Realities Of Writing Young Adult Fiction”. First up: Oh noes! You can’t tell a YA book by its cover! There’s an old saying about judging a book by its cover; we’re not sure how it goes, but it doesn’t matter because titles and covers both appear to be generated completely at random. At least, in the world of Young Adult novels. Jack named his latest book The Librarian. At the publishers’ request, it became Double Agent. A little editing later, and the title was Escape From Besmar. A little more, and that was subbed out in favor of the catchier Springheel. At one point, the title was Black Sheep. Then Three Bags Full. Then Three Bombs Full. Then, at last, they settled on a title that pleased everyone: Switchblade. The book is currently available under the title The Cut Out…. (15) XENA. Lucy Lawless on the “Xena” revival, her new show and seizing life with both hands at Women in the World. …So the question of Lucy Lawless’s age, 47, is central to the Xena reboot, raising obvious retorts: Harrison Ford, 73, Arnold Schwarzenegger, 68, and Bruce Campbell, 57, are all reprising action hero roles they played in their youth without any criticism or complaints being raised about their age. (16) GoT TEASER? The Game of Thrones Season 6 teaser. I can confidently say I didn’t understand it. But io9 seems to. Maybe you will, also. (17) CHARITY BEGINS AT HOME. Cards Against Humanity went offline on Black Friday and offered customers the ability to buy nothing for $5. They got nearly $72.000… most of which they spent on themselves! 11,248 people gave us $5, and 1,199 people gave us more than $5 by filling out the form more than once. One enthusiastic fan gave us $100. In the end, we made a windfall profit of $71,145. Cards Against Humanity is known for our charitable fundraising – since 2012 we’ve raised nearly $4 million for organizations we love like Worldbuilders, the Sunlight Foundation, the EFF, DonorsChoose.org, the Wikimedia Foundation, and the Chicago Design Museum. We even started a $500,000 full-ride scholarship for women getting degrees in science. There’s been a lot of speculation about how we would spend the money from Black Friday, and we’re happy to announce that this time, we kept it all. Here’s what we bought…. (18) ROLLING STONE. Star Wars fatigue is probably setting in already, but Rolling Stone has good interviews with several major cast members (plus a few spoilers, of course) in “’Star Wars’ Strikes Back: Behind the Scenes of the Biggest Movie of the Year”. The “this” in question is Star Wars: The Force Awakens, out on December 18th and directed by geek hero J.J. Abrams, fresh from rebooting the Star Trek franchise. (19) ANCIENT SPECIAL. And if you weren’t fatigued before, well, just watch the elusive Star Wars Christmas Special from that bygone era….